staining readily with eosin; pertaining to eosinophils or to eosinophilia. Staining readily with eosin dyes; denoting such cell or tissue elements. 1. readily stainable with eosin. 3. pertaining to or characterized by eosinophilia. 1 the tendency of a cell, tissue, or organism to be readily stained by the dye eosin. 2 pertaining to an eosinophilic leukocyte. streaks of eosinophilic matrix in cartilage. Some are normal zones of development, others represent areas of matrix degeneration and osteochondrosis. a primary mediator of type I anaphylactic hypersensitivity, it is an acidic peptide (molecular weight 500) released by mast cells, which attracts eosinophils to areas where it is present. acanthosis and hyperkeratosis accompanied by eosinophilic granulomas in pancreas and other epithelial organs. a collective name given to the lesions of eosinophilic ulcer, eosinophilic plaque (below), and linear granuloma because of similarities in histopathology, clinical course and occasionally simultaneous occurrence in the cat. nodules or plaques that occur on skin or oral mucosa of dogs. Usually not pruritic, but oral lesions can cause some difficulties in eating. The cause is unknown. See also feline eosinophilic granuloma complex (above), equine nodular collagenolytic granuloma. see sodium chloride poisoning, angiostrongyluscantonensis. in cattle may be observed in normal animals at slaughter. Histologically there is a predominant eosinophil invasion of the heart muscle. May be accompanied by similar lesions in skeletal muscles. well-defined, raised, ulcerated and extremely pruritic lesions that occur on the skin of cats, usually on the abdomen or hindlegs. There are large numbers of eosinophils present in the dermis and sometimes peripheral blood. See also eosinophilic granuloma (above), feline eosinophilic granuloma complex (above). 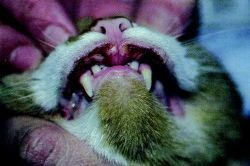 a well-defined ulceration, usually on the upper lip of cats overlying the canine tooth, which is shallow initially but can become extremely erosive and sometimes neoplastic. Mildly irritating to the cat. Called also indolent ulcer, rodent ulcer. See also feline eosinophilic granuloma complex (above). Through this grant, I hope to better understand which patients might benefit from PPI therapy, and therefore reduce some of the trial and error treatment approaches we currently follow in eosinophilic esophagitis. Eosinophilic cystitis is a rare and exceptional condition, respectively, in adults and children. MEED must also be differentiated from other chronic inflammatory bowel diseases of horses, including granulomatous enteritis (GE), lymphoplasmacytic enterocolitis (LE), and idiopathic eosinophilic enterocolitis (EC). Diagnosis and classification of eosinophilic granulomatosis with polyangiitis (formerly named Churg-Strauss syndrome). The eosinophilic blood cell count was normal and US showed slight thickening of the bladder wall of up to 5 mm (Figure 5). Keywords: Cholelithiasis, Cholecystectomy, Eosinophilic cholecystitis. However, mixed type food allergies include both IgE-mediated and cell mediated mechanisms and clinical findings (eosinophilic esophagitis, eosinophilic gastritis, esosinophilic gastroenteritis) generally occur within a certain time after consumption of food (1, 2). Eosinophilic oesophagitis in Cape Town, South Africa (abstract). Q Our year-old male cat, found at a county animal shelter seven months ago, has been diagnosed with eosinophilic granuloma complex (EGC). Topical steroid therapy improved some indicators of mucosal integrity in patients with eosinophilic esophagitis, but proton pump inhibitor therapy did not, two studies showed. ClickPress, Fri Oct 10 2014] Global Markets Direct's, 'Eosinophilic Esophagitis - Pipeline Review, H2 2014', provides an overview of the Eosinophilic Esophagitis's therapeutic pipeline.